Jones Family Farms on Lopez Island works through regulations and harvesting challenges to bring back ‘singing scallops,’ and Seattle chefs are eating them up. “FARMING IS VIOLENT. Shellfish farming is nurturing,” observes Nick Jones, who engages in both on Lopez Island. Nick and Sarah Jones run Jones Family Farms, where they raise grass-fed, free-range livestock, and cultivate oysters, clams and mussels in a three-acre tidal lagoon along Shoal Bay. 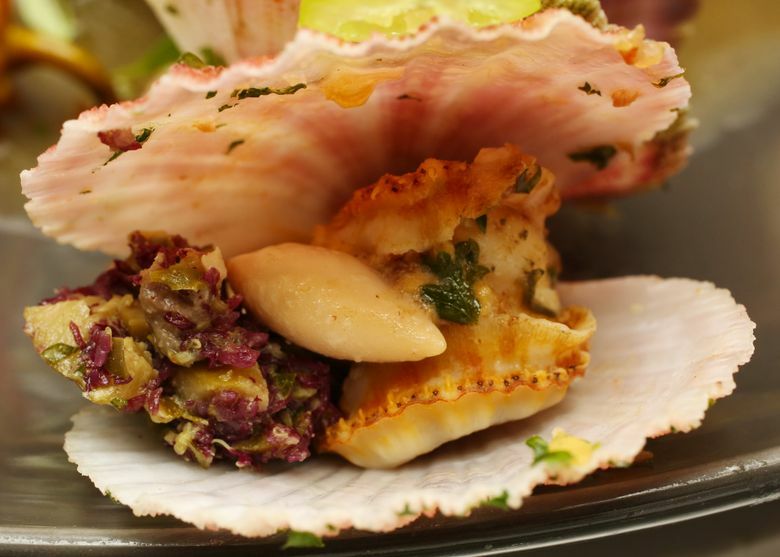 These are not people who shy away from a challenge, so when Nick first heard about a nearly forgotten local shellfish called pink scallops, he became obsessed with the idea of bringing them back to market. More formally known as Chlamys rubida, and sometimes called singing scallops or singers because of the way they open and close while moving through the water, pink scallops flourish in the San Juan and Canadian Gulf islands. Tightened regulation, coupled with the challenges of harvesting and transporting these fragile bivalves, which can survive out of water for only 48 hours, led to their disappearance from markets and menus for two decades. I discovered pink scallops on my first visit to Seattle in 1990. They were on the menu at Ray’s Boathouse, and I will never forget them. With their fan-shaped, coral and mauve shells, they looked like a mermaid’s bridal bouquet. They taste less sweet than regular scallops, more like a rich clam with a hint of oyster-ish salinity, especially if their bright orange roe sac is still attached. Charles Ramseyer, executive chef at Ray’s from 1991 until 2006, remembers it was “always a magical night when we had them for a special.” Pink scallops weren’t easy to come by, even back then. When the season opened for picking twice a year, Ramseyer would start calling the few commercial divers he knew who could get them. 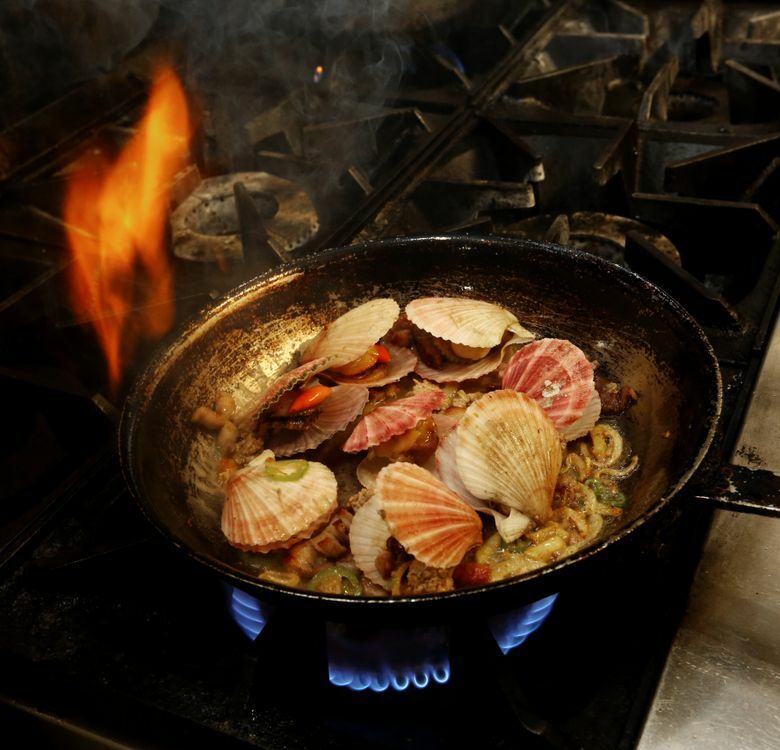 Guests were always intrigued, and they always wanted to keep the shells, so “We rinsed and cleaned them, put them in a to-go box and sent them off with a memory for life,” Ramseyer says. In the 2003 cookbook “Ray’s Boathouse: Seafood Secrets of the Pacific Northwest,” Ramseyer included a recipe for his favorite way of preparing singers: steamed in butter and white wine with garlic, shallots, thyme, parsley and roasted red pepper. 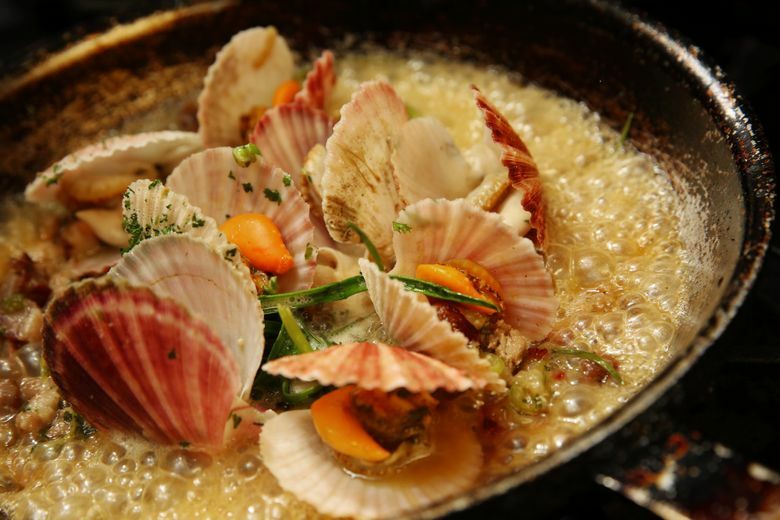 Tamara Murphy, another chef with fond memories of pink scallops, says she can’t exactly recall how they prepared them at Campagne Restaurant in the 1990s, but guesses it was probably the classic French combination of wine, butter, lemon and fines herbes. These days, at her Capitol Hill restaurant Terra Plata, she is more likely to flavor the broth with saffron, Aleppo pepper, tarragon and lime, or with smoked paprika and a touch of cream. “It’s nice to have them back,” she says. 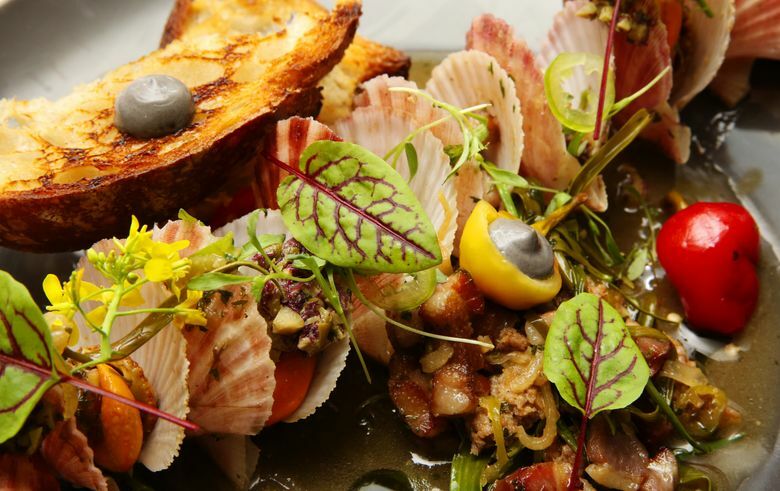 Maximillian Petty, 28, is too young to remember the first wave of pink scallops, but he’s geeking out with them now at his Queen Anne restaurant, Eden Hill, testing the possibilities. He bakes them on a bed of salt and dresses them with pickled foie gras mignonette. He tops grilled singers with pickled vegetable brunoise. For steaming, he’s fond of a caramel-y broth of miso, butter, ginger and ponzu. He chefs it up at the restaurant with house-made ginger sausage, seaweed tapenade, black garlic aioli and grilled herbs like goosetongue. 1. Scrub the scallops well, and soak in cold water to purge sand. 2. Heat the oils in a large pan. Add shallot, ginger and garlic, and cook on medium heat until softened, about 5 minutes. Add rice wine or sake, and bring to a boil for about 2 minutes. Mash miso and butter together and add to the pan, along with sugar and ponzu. Simmer for a few minutes, stirring to dissolve miso. 4. Add lime juice and chopped cilantro to taste, or dress whole cilantro stems with a little oil and salt, and char them on a plancha or hot griddle. 5. Serve with cilantro stems on top and grilled bread on the side.